A while ago there was some pretty heated debate about cleaning bottles. The discussions took place on Western Bitters News, Peachridge, the WWG (here) as well as on another website which shall remain un-named. The anonymous website had some extremely harsh (bordering on fanatical) words to say about the morality or, (according to them), lack thereof, involved in cleaning bottles. It seemed that everyone had their own slant on bottle cleaning; self included. By far and away though, most supported the procedure, assuming that, if and when the bottle was to change hands, both parties were aware of said cleaning. 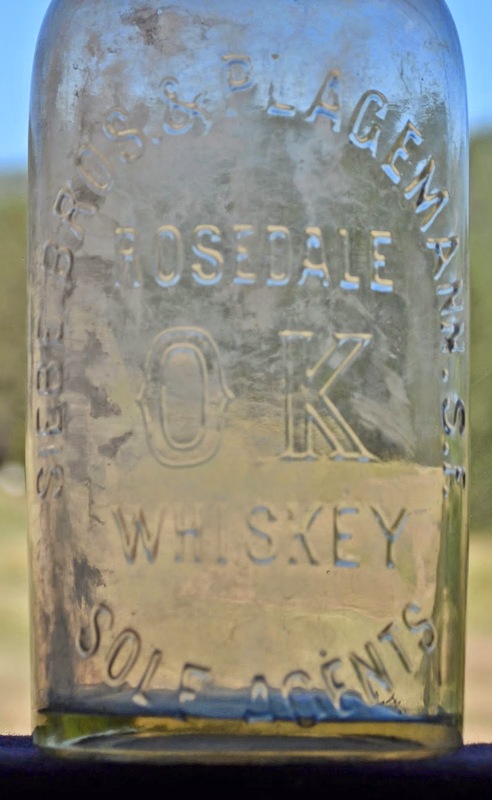 "Thanks to what I've recently learned, I think that it's a travesty to leave a good (but stained) bottle stuffed away when it can be restored to as new appearance and be proudly displayed for all to enjoy." Recently, a good friend of mine got into the good stuff. The mailman arrived with a gift from him a couple of days after we chatted about the dig. It was a Rosedale OK "German connection" glop top. Neat bottle, I guessed, beneath an eighth of an inch of stain and crud. Odd, the stain was pretty much a dead ringer for the Hoofland's "case of leprosy". To clean, or not to clean... I bit the bullet and took a chance. The stain had to go and the Hooflands would be the guinea pig. I was stunned after the "Ol Bottle Doc." had worked his magic on it. With that dilema put to bed, I made the decision to take a chance on the German Rosie. Check out the before and the after. And so I pose the question; Is the practice of cleaning deserving of tar and feathering, drawing and quartering or jail time as another author so pointedly espoused? One of the negatives voiced last year, in opposition to cleaning, was that large amounts of glass were cut off a bottle by the polishing compound in order to remove the stain. This intrigued me, and I wondered just how much glass was in reality "shaved" from a bottle in the process of cleaning. I used an expensive dial caliper on the Rosie prior to having it cleaned. I measured at the base, across the widest part of the reverse, and across the horizontal leg of the "A" in "Agents" on the obverse. It measured 3.223". The bottle was machine cleaned for a total of 120 hours. When I got the bottle back in my office and shot the photos after cleaning, I re-measured it. It measured 3.223". 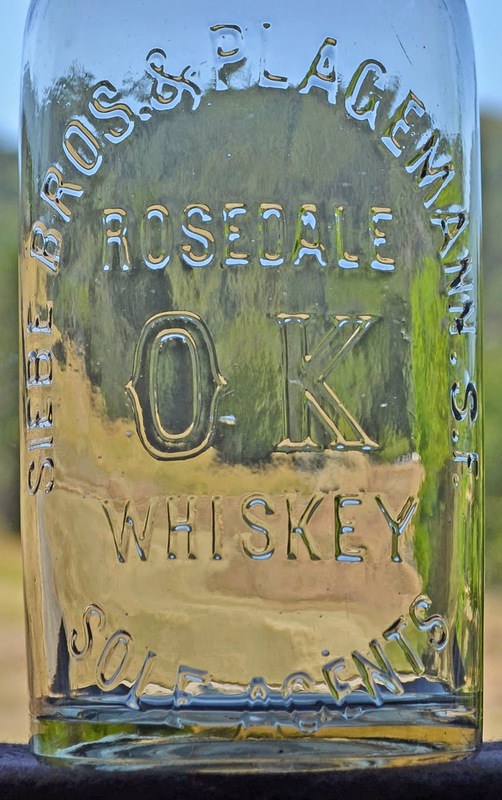 Restoration is acceptable & common place in all collectibles, bottles are no exception. It’s entirely possible to clean a bottle and not change or diminish its original surface. A properly cleaned bottle not only looks better & like it’s original condition but can also enhance its value. There’s an individual with a blog and his own agenda who doesn’t understand this possibility or technique and is misinforming other members of the hobby though his ignorance. If folks prefer to look at sick bottles altered by years of being buried in acidic soil then that’s their own personal choice. The problem is, there’s lots of cleaning being done by people who don’t know what their doing. I can’t even begin to tell you how many good bottles I’ve seen in recent years that were un- necessarily ruined by attempted cleaning. There are products readily available that can make anyone an instant bottle cleaner with no prior knowledge or skill. Using certain compounds being sold for bottle cleaning are more suited for rock tumbling rather than fine conservation of antique glass. When these compounds are applied they will remove glass striping a surface leaving an almost mirror like finish. I totally understand why some don’t like cleaning when so many bottles are being ruined.